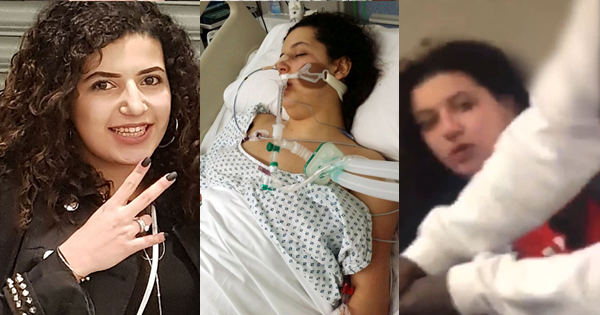 Engineering student Mariam Moustafa, 18, died three weeks after she was allegedly attacked by a group of girls in Nottingham. Watch Video when she was attacked and her video few months before attack she tells she is not feeling safe and asked for help ! Mariam was set upon by a gang of girls outside a shopping centre in the East Midland city while she waited for a bus. She had been shopping in Nottingham before being repeatedly assaulted by the women in what appeared to be an unprovoked attack. Mariam’s uncle Amr El Hariry, 46, said he believed a group of about 10 girls had started beating his niece before she ran to get on a bus. He said the girls kept beating her until she passed out and a man intervened to help. Her younger sister, Mallak Moustafa, 16, said her sibling told her how the attack unfolded before she went into a coma. She told the BBC: "My sister couldn't see as she'd been hit in the head but then as soon as she saw our bus coming, she ran to it, trying to get on it. "She got on to the bus, she didn't think they'd all pay £1 to get on but they went up to her when she'd sat down and said they weren't finished with her. "Then the girls kept saying punch her more, punch her more. Then she couldn't see what was going on." Nottinghamshire Police confirmed she had been “punched several times,” adding she then got on a bus but was followed "by the same group of women who were threatening and abusive towards her before they got off". A 17-year-old girl was arrested on suspicion of assault occasioning grievous bodily harm and was subsequently released on conditional bail.